This means that the International Safety Equipment Association (ISEA), in conjunction with leading industry stakeholders, developed a new standard for first aid kit in the workplace. This changes the requirements for businesses in order to maintain OSHA & ANSI First Aid Compliance. The ANSI Standards were originally set in 1998, significantly overhauled in 2003 and 2009, then augmented with considerable additional requirements in 2014, updating and expanding ANSI/ISEA Z308.1-2009.... a subsequent revision in 2015 corrected a minor technical revision to the 2014 edition, which was published on June 17, 2015 - settling the "comply by" date as June 17, 2016. The updated standard classifies first aid kits based on the assortment and quantity of first aid supplies intended to deal with most types of injuries and sudden illnesses encountered in the workplace including: major wounds, minor wounds (cuts and abrasions), minor burns, sprains and strains, and eye injuries. The assortment and quantity of supplies included in a first aid kit were chosen based upon a review of increased workplace incidents requiring first aid treatment, similar international standards and current practices in treating injuries. Class B kits with a broader range and quantity of supplies to deal with injuries in more complex or high-risk environments. The concept is that by expanding the required items in a basic workplace first aid kit, employees will have greater access to items needed to treat common workplace injuries. Many of the first aid supplies previously identified as being recommendations in the 2009 standard are now required for both newly-designated kit types. In addition, scissors are to be included in both classes of kits and (big change here!) a splint and a tourniquet are both required for a Class B first aid kit. Well, like most OSHA regulations, this is up to "interpretation". What does that mean? Well - an OSHA Inspector has a lot of leeway in deciding if your first aid kit is OSHA compliance or not. While paragraph (b) of 29 CFR 1910.151 requires that "in the absence of an infirmary, clinic, or hospital near the workplace, a person or persons must be adequately trained to render first aid. Adequate first aid supplies must be readily available," it leaves the required supplies semi-ambiguous. Elsewhere, they state"
First aid supplies are required to be readily available under paragraph § 1910.151(b). An example of the minimal contents of a generic first aid kit is described in American National Standard (ANSI) Z308.1-1998 "Minimum Requirements for Workplace First-aid Kits." The contents of the kit listed in the ANSI standard should be adequate for small work sites. When larger operations or multiple operations are being conducted at the same location, employers should determine the need for additional first aid kits at the work site, additional types of first aid equipment and supplies and additional quantities and types of supplies and equipment in the first aid kits. So...do you need to comply with 1998 standards, or more recent? Z308.1 - 2003, Minimum Requirements for Workplace First Aid Kits. additional first-aid equipment and supplies. "I say err on the side of caution," OSHA Safety and First Aid Expert Matthew Henry suggests. Mr. Henry, a former EMT who has contributed to several Cal/OSHA advisory Boards, and is the author of the frequently cited industry guidelines The Do's & Don'ts of First Aid Compliance and Deciphering OSHA's first aid requirements notes that "OSHA and it's inspectors assume responsible businesses will update to the latest guidelines. If you get an Inspector on a bad day - she or he isn't going to care that the OSHA guidelines refer to various editions of the ANSI guidelines - the inspector will expect the business to be meeting the most recent Z308.1 edition." As they say, "ignorance of the law is no excuse". 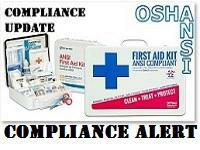 Click the image on the right to join the OSHA & ANSI First Aid Update list: You'll get email notices of OSHA & ANSI First Aid Regulations & Guideline updates including the release of NEW ANSI 2015 Kits + “upgrade packs” to keep you compliant! That is the easy part. Buy a new first aid kit or cabinet - or purchase a "refill pack" designed to the new 2015 ANSI First Aid guidelines to put in your current kit or cabinet. Your current kit or cabinet probably has missing or expired products anyway. Companies like First-Aid-Product.com (the leading e-tailer of first aid kits) have already designed and made available dozens of new ANSI compliant First Aid kits and cabinets. What's more - they've broken them down by industry, number of employees, and need... so you don't have to guess whether you need ac ANSI class A or ANSI class B first aid kit. Just choose your industry and number of employees, and you'll fins the 2015 ANSI First Aid Kit or ANSI First Aid Cabinet to fulfill our needs. Over 20 States cite the ANSI Z308.1 requirements as their State Mandated Workplace First Aid Guidelines - these supersede OSHA guidelines, so would specifically (as opposed to interpretively) require that a business have First Aid Kits compliant with the latest ANSI release. You must maintain the full content to be compliant (so whether refilling an old cabinet, or purchasing new -it's a good idea to grab an "ANSI First AId Refill" pack to keep aside to refill when your kit gets depleted or an Inspector decides to drop in. If you decide to just purchase a "New ANSI 2015 First Aid Guidelines" refill pack to place in an older kit - you won't meet the outer labeling guidelines.